Day three of the Cuban Experience tour took us into some of the most scenic views I had the pleasure of seeing in Cuba. The Vinales valleys are deep, high, lush and never-ending. 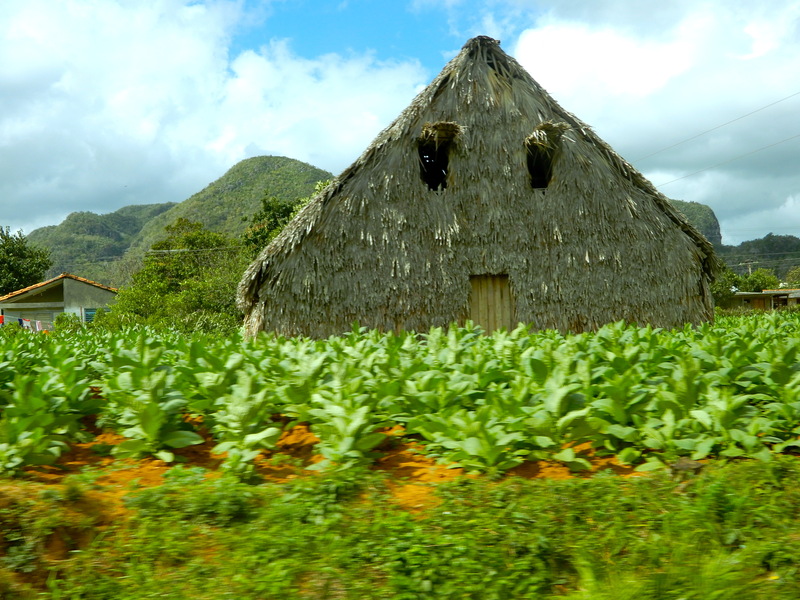 The Vinales region is an approximately 2hr 30 mins drive from Havana and a flourishing expanse dotted with tobacco farms. You will get your best priced cigars directly from a farm owner and this one had a little shop selling them by the bundle. Shock horror, I went to Cuba and didn’t buy any cigars – nope – not even as a souvenir. I just didn’t feel any desire to bring any home – I don’t smoke and I’m very happy with bits an pieces of arts and crafts and bagged during my trip. I suppose you could probably say cigar rolling is a craft since its all done by hand and in the cigar factories the staff have to unroll them and start again if they’re not rolled to correct width and length. Thatched designs are a bit of a common theme throughout Cuba, not just in Vinales. Cotswalds eat your heart out! Tobacco leaves are hung up to dry inside until the are ready to roll! Cowboy hats are also a popular look – love it!! Dipping cigars in honey before smoking is still a common habit apparently. A prehistoric cave and underground river located in the Vinales region. I think this dog knows the green cross code!